Left: Shrimp po' boy from Louisiana. A key ingredient that differentiates po' boys from subs, gyros, and grinders is the bread. Louisiana French bread is different from the traditional American baguette, in that it has a flaky crust with a soft, airy center. This is generally attributed to the high ambient humidity causing the yeast to be more active. It also differs from the bread usually used for sub-style sandwiches in the rest of the country, which has a soft exterior. Typically, the French bread comes in two foot long "sticks". 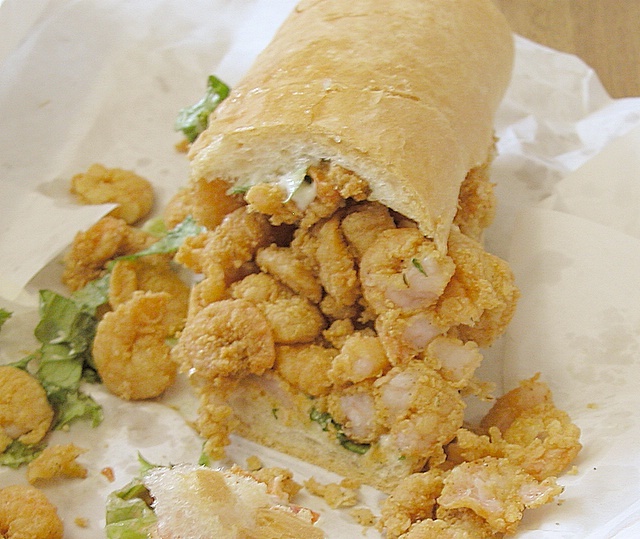 Standard sandwich sizes might be a half po' boy, about six inches long, and a full po' boy at about a foot long. But they can be prepared in longer and shorter versions for group events. The traditional versions are served hot and include fried shrimp and oysters. Soft shell crab, catfish, crawfish, Louisiana hot sausage, roast beef, and french fries are other variations frequently served. The latter two usually are served with roast beef gravy. A "dressed" po' boy has lettuce, tomato and mayonaise; pickles and onion are optional. Non-seafood po' boys will also usually have mustard, but the customer is expected to specify whether they want "hot" or "regular" - the former being a coarse grained Creole mustard and the latter being American yellow mustard.